And yet, identifying what makes genres and subgenres tick is important, if not for critics, then for musicians themselves. Musicians try on established genres for reasons spanning the full spectrum from cynical to sincere, but the understanding is what’s key. The conventions make up an important foundation, a base coat, and the resulting rapport with established audiences is where the work can begin. From there, artists can seek perfection, subversion, innovation, or simple imitation. Massachusetts band Speedy Ortiz have a deep and functional understanding of 90s indie rock. This much becomes clear within the first few minutes of their latest full-length album, Foil Deer. They could probably churn out a competent indie rock album in their sleep, but the real question is whether they will use their powers for something greater, or whether they will simply try to hitch onto the nostalgia-gravy express. Thankfully, the answer is the former. Opener and preamble “Good Neck” crackles with dual-guitar interplay from Devin McKnight and Sadie Dupuis. Polvo! Fugazi! Drive Like Jehu! Well, maybe not so much the last one, but a bunch of other neat bands! “Raising the Skate” carries the momentum with rambling, skittering guitar lines that unfurl only loosely tethered to notions of simple repetition. The guitars have some bite and some crunch as well – this ain’t no gentle-strummin’ wimp rock! They collude closely with the rhythm section of drummer Mike Falcone and Darl Ferm, who themselves lurch with loose-limbed certitude through accents and rhythmically challenging start-stops, keeping the songs from being easily trivialized or pinned down. There is a good deal of stylistic variety on Foil Deer. Sometimes it can be a little jarring. “Puffer” is a menacing, hip-hop bounce-inflected pop punk ditty that seems mostly pointless now that Sleigh Bells exist. The subsequent “Swell Content” seems below the band’s capability as well, charging through a rockin’ rave-up that has bafflingly little personality. Instrumentally, Foil Deer exemplifies a studied looseness that, coupled with judicious technicality, recalls 90s bands that challenged themselves without pushing away their audiences. Dupuis’ strong, sincere vocals and astute lyrics take the listener by the ear and don’t let go. The resulting diorama is reminiscent of a more amplified, less flippant Smart Went Crazy. However, there are echoes of a whole decade inside Foil Deer. What is remarkable is that Speedy Ortiz manage to evoke so many positive associations from that era without falling into the tempting traps of tribute and mimicry. The closing pair of “Mister Difficult” and “Dvrk Wvrld” are intimate and entrancingly sad, pulling at the heartstrings just before the silence. 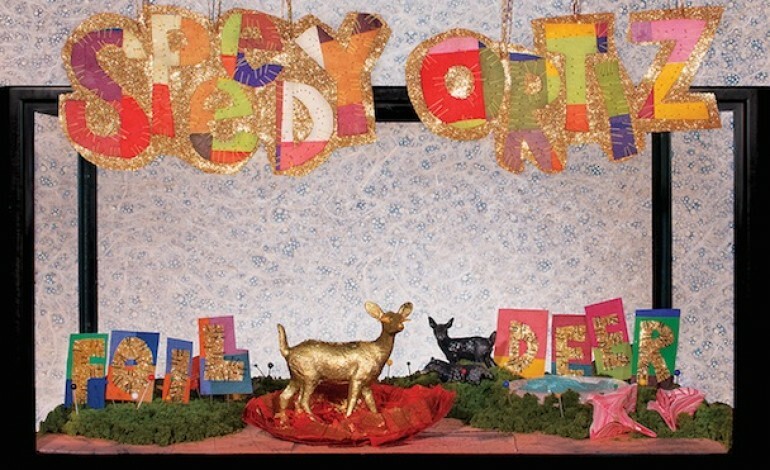 They demonstrate what is true of the whole album; Foil Deer is built partly on borrowed techniques and nostalgic songwriting, but the living soul of the album – and all of the animate emotion pouring forth from within – belong completely to Speedy Ortiz.